As a Linux admin, we may come in a situation like, to find WWN number of HBA and scan the FC Luns in LINUX which are provided by Storage team. Its need to be scan from the Linux OS side without rebooting server. So How to find WWN number of HBA and scan the FC Luns in LINUX without rebooting the server? 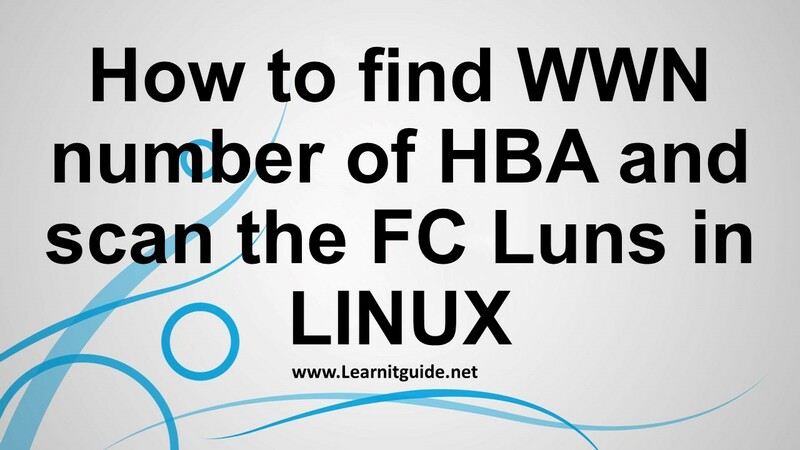 Here is a solution to find WWN number of HBA and scan the FC Luns. Note the number of hosts available in the server. We have Two HBA here from the above example (host0 and host1). If you have more HBAs, replace "host0 or host1" with "hostN ". In most cases, System admins need to provide the WWPN to storage admins for the storage allocation. If you have more number of hosts file under the directory /sys/class/fc_host, then use the command for each hosts file by replacing the "host0". From Redhat Linux 5.4 onwards, redhat introduced “/usr/bin/rescan-scsi-bus.sh” script to scan all the SCSI bus and update the SCSI layer to reflect new devices. We can also use the "rescan-scsi-bus.sh" script to detect new LUNs without rebooting the server. This script is available with sg3-utils package. So install the sg3-utils package using yum, refer this link to configure yum repo server in Linux. Now check the detected disks using fdisk command.